Justin Ramsey completed his PhD in Botany at the University of Washington and was an NSF Postdoctoral Fellow at the University of Guelph in Ontario, Canada. Justin’s research is focused on ecological adaptation and systematics of the North American yarrows (Achillea borealis, Asteraceae), a polyploid complex of ecological races in diverse climatic and edaphic conditions; he also collaborates with Tara Ramsey on studies of polyploidy in ivies (Hedera spp., Araliaceae) and directs conservation-focused projects on forest and grassland habitats. Justin teaches undergraduate courses in plant biology at Black Hills State University. Tara Ramsey completed her graduate studies in Botany at Miami University of Ohio (MSc) and the University of Washington (PhD). Tara’s research is focused on the invasion biology and systematics of English ivy (Hedera spp., Araliaceae), an ornamental vine that has become an aggressive invader in coastal forests of the U.S. and Canada; she also collaborates with Justin Ramsey in studies of ecological adaptation in Wild Yarrow. Tara coordinates Ramsey Lab educational outreach and conservation-related activities, including recent work in grasslands and old-growth forests. Tara teaches undergraduate courses in plant biology at Black Hills State University. Adam Green completed his BSc and MSc in Cellular & Molecular Biology at the University of Rochester. Adam’s PhD research focused on the molecular systematics and biogeography of ivies (Hedera spp., Araliaceae) in their native and introduced range, a project that combined DNA sequencing, field sampling, and common garden experiments. 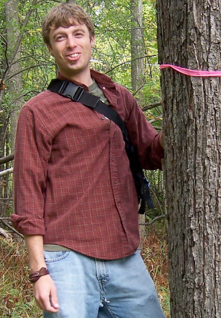 Adam also provided the GIS/GPS know-how for Ramsey lab forest conservation activities and helped develop the EEB Lab. Adam completed postdoctoral research in Brian Husband’s lab at the University of Guelph (genetic consequences of polyploidization in Arabidopsis), served as visiting assistant professor at Colgate University in 2014-2015, and is now a Science Curriculum Designer at IXL Learning in San Francisco. Rob Laport completed his BSc in Biology at Oregon State University and worked for several years at the Fred Hutchison Cancer Institute (Seattle). Rob’s PhD research combined field experiments and molecular data to study polyploid speciation in the North American creosote bush, a polyploid complex of diploid, tetraploid, and hexaploid cytotypes; he also provided taxonomic and soil analysis know-how for Ramsey lab forest conservation activities. 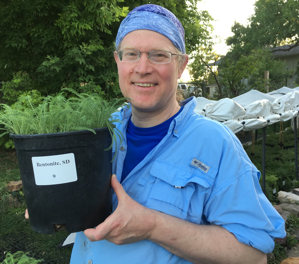 Rob was a teaching assistant for lab courses in Genetics and Ecology & Evolution, and also instructed an ecology course at the Rochester Institute of Technology. Rob was a postdoctoral fellow in Diana Pilson’s lab at the University of Nebraska-Lincoln, where he studied ecologically-mediated aspects of reproductive isolation in creosote bush. Currently Rob is a post-doctoral researcher and course instructor at the University of Colorado. Erin Fox completed her BSc in Biology at the University of Rochester. 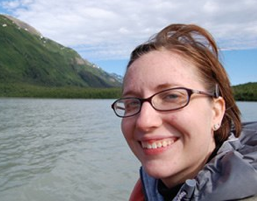 She was a De Kieweitt Fellow and conducted field and lab research in the Ramsey lab from 2006-2008. 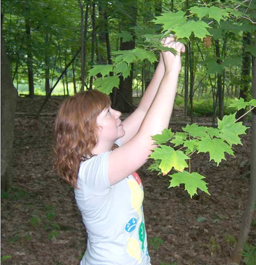 Erin’s senior thesis evaluated interspecific hybridization and introgression between Silver Maple and Red Maple in upstate New York, as well as the natural occurrence of the so-called Freeman’s Maple. Erin worked for several years as a research technician in the Department of Medicine in the University of Rochester Medical Center, and recently moved to Seattle to work in the biotech industry. 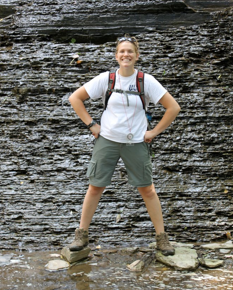 Emily Reiss completed her BSc in Earth & Environmental Science at the University of Rochester. She was a teaching assistant for BIO 263 Ecology, maintained Achillea accessions in the greenhouse, and conducted field and lab research from 2006-2008. Emily’s senior thesis focused on the occurrence of triploidy in ivies (Hedera spp., Araliaceae) and its potential utility for producing sterile cultivars. Emily worked as an energy efficiency consultant for Bright Power, Inc., for several years and in 2012 enrolled in the PhD program in the Department of Horticulture at Cornell University (Laura Drinkwater’s lab), where she is studying the use of cover crops in agriculture. Julia Cosgrove completed a B.Sc. in Ecology & Evolution at the University of Rochester. She was a teaching assistant for BIO 263 Ecology, a member of the summer 2010 field crew, and conducted independent research in the Ramsey lab from 2009-2011. For her senior thesis, Julia evaluated canopy tree composition and coarse woody debris abundance of old-growth forest stands across Monroe Co., NY. 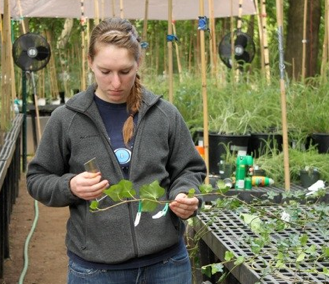 After graduation, Julia worked for several years as a research technician in Whendee Silver’s ecosystem ecology lab at UC-Berkeley; she is now an intern at the Farm Training Program at the University of Vermont. Annalise Kjolhede completed her B.Sc. in Earth & Env. Sciences at the University of Rochester. 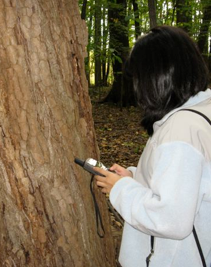 She was a summer field assistant with the Ramsey lab in 2010 and 2011, and for her senior thesis, investigated the geology of old-growth in Monroe County and tested associations between soil features and abundances of tree species. 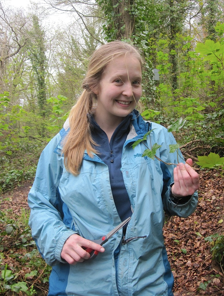 In spring 2012, Annalise traveled to the UK, France, Italy, and Germany to sample native-range ivies for ongoing studies of North American ivy invasion. In fall 2012, Annalise was preparing for winter work as a ski instructor, when she had a tragic accident. She passed away on 13 November 2012. Annalise was a beloved member of the Ramsey lab and the U of R community, and had many friends and family members across the world. We miss her very much. Caitlin Smigelski completed her B.Sc. in Earth & Environmental Sciences at the University of Rochester. 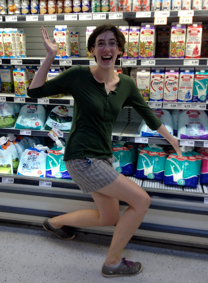 As a KEY scholar in 2010-2011, Caitlin developed organic gardening methods for use on the UR South Campus and introduced locally-grown produce to campus dining services. Caitlin was a field assistant in the summers of 2010 and 2011, during which time she surveyed old-growth and second-growth forests and managed Achillea experiments in the greenhouse. Along with comrade Annalise Kjolhede, Caitlin traveled to Europe in 2012 to sample native range ivies for ongoing studies of North American Hedera invasion. Caitlin enrolled in the Physical Therapy grad program at Upstate Medical (Syracuse) in 2013 and now practices in Portland, Oregon. 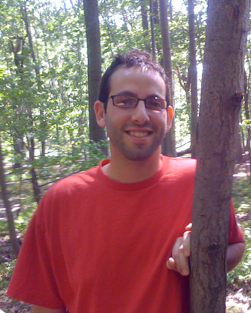 Aviv Brokman completed degrees in Ecology & Evolutionary Biology and Mathematics at the University of Rochester. 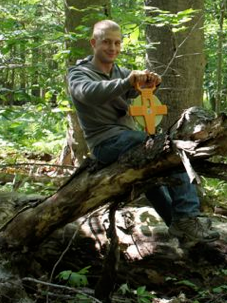 Aviv participated in field research efforts from 2009-2011, including surveys of avian communities, characterization of species composition and “invadedness” of old-growth vs. second-growth forests, and testing of spatial autocorrelation in the plant communities of fragmented habitats. In 2011-2012, he also managed Achillea experiments in the greenhouse. Aviv is now a graduate student in the Department of Biology at the University of Kentucky, where he studies theoretical ecology in Phil Crowley’s lab. Dana Hilfinger completed degrees in English Literature and Mathematics at the University of Rochester. She completed a fifth year study program in ecological sustainability, and after graduating in 2011, worked on the Ramsey summer field crew. Dana assisted with surveys of second-growth forest stands and set-up of Achillea experiment in the garden and the greenhouse. In 2011-2012, she served as an AmeriCorp intern working with Rochester-area Parks & Recreation and provided part-time assistance in the lab and greenhouse. 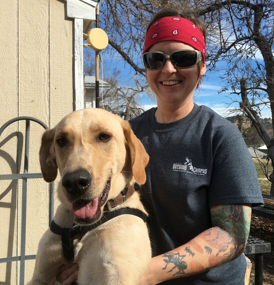 Since fall 2012, she has worked in a follow-up AmeriCorp position in New Mexico. Colleen McHale completed her B.Sc. in Ecology & Evolution at the University of Rochester. She was a UR Sustainability Intern with the Ramsey lab in summer 2011 and assisted in studies of the structure and composition of second-growth forests as well as preparation of herbarium materials for South Campus plants. 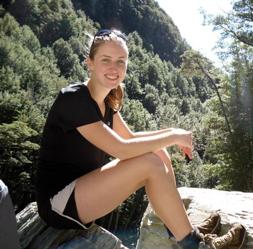 In spring 2012, Colleen traveled to Sydney, Australia, for a study abroad program, and continued working with the Ramsey lab with an assortment of field and lab projects in 2012-2013. Audrey Kelley completed her B.Sc. in Ecology & Evolutionary Biology at the University of Rochester, and was a teaching assistant for BIO 263 Ecology in 2011. 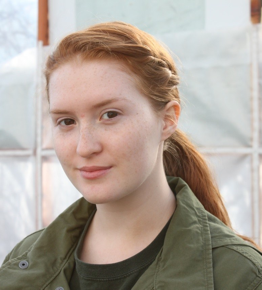 Audrey worked in the Glor lab for several years researching display diversity and mate choice behavior of Anolis lizards, and during summer 2011, assisted the Rieseberg lab (UBC) in studies of natural selection on the flowering phenology of wild sunflowers in Texas. In 2012, Audrey enrolled as a PhD student in the Department of Biology at the University of North Carolina, where she is working with evolutionary ecologist Karin Pfennig. Olivia Morgan completed her B.Sc. in Ecology & Evolution and B.A. in Studio Arts at the University of Rochester. 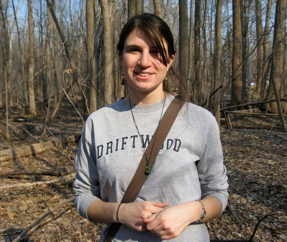 She assisted with forest surveys in summer 2011, and in summer 2012 held an NSF REU position studying the taxonomy of North American yarrows. In addition to performing flow cytometry analyses and morphometric measurements, Olivia produced line drawings of Achillea plants to develop technique in botanical illustration. 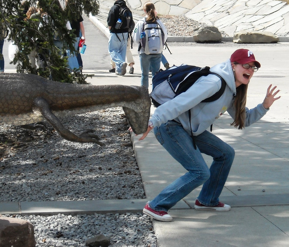 From 2012-2014, Olivia served as a TA for BIO 263 Ecology, wrote a senior thesis on Achillea taxonomy, and helped moved the Ramsey lab to Black Hills State University. 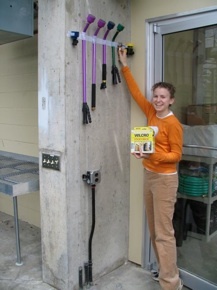 Olivia recently moved to Portland, OR, where she has taken an Americorp position in stream restoration. 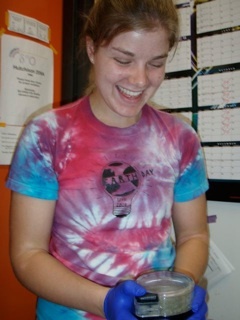 Taylor Hubble studied Earth & Environmental Sciences at the University of Rochester in 2011-2012. She was a UR Sustainability Intern with the Ramsey lab in summer 2012 and assisted with conservation endeavors on the South Campus. Taylor was responsible for developing several new trails in the so-called “North Woods” parcel and also for establishing composite platforms through a seasonal wetland area on the boundary between the “Whipple Woods” and “South Woods.” She also helped with greenhouse experiments and data entry. Taylor transferred to Indiana University in 2013 to be closer to her family and have access to a broader array of ecology coursework. 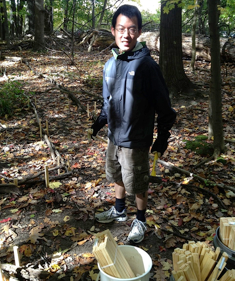 Tim Tsai completed his BSc in Ecology & Evolutionary Biology at the University of Rochester. Tim assisted field and greenhouse projects in the Ramsey lab from 2012-2014, including trail development on the U of R South Campus. 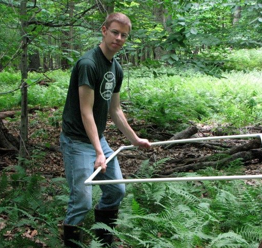 In summer 2013, he investigated stomatal traits and transpiration rates of diploid Hedera helix and tetraploid H. hibernica, ivy species invading different geographic regions of the U.S. and Canada. Tim is now an MSc. student in the University of Connecticut EEB program, and is studying the evolution and developmental origins of floral structures in the plant genus Pelargonium. Margaret Ball completed a B.A. in Anthropology and a minor in Biology at the University of Rochester. 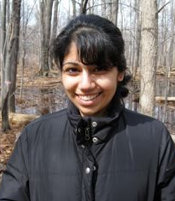 She assisted with ecological research activities from 2008-2010, including studies of canopy tree composition and understory plant communities of Rochester forests. Margaret completed an internship at the Farmscape Ecology Program in Columbia Co. in 2009, and for her senior thesis, studied societal attitudes and impacts of hydro-fracking in the Marcellus Shale. Margaret worked for a while in organic farming and in 2014 entered the graduate program in the Dept. of Crop & Soil Sciences at Cornell University. There, she works with Matthew Ryan’s lab studying organic grains and weed/crop competition. Adam Mattison completed a B.A. in International Relations at the University of Rochester while participating in the Navy ROTC program. He was a member of the 2010-2012 summer field crews, assisting with field surveys of canopy trees and tree coring efforts, as well as bridge construction and trail lining on the South Campus; Adam also assisted with irrigation and general maintenance of the greenhouse and experimental garden. In August 2012, Adam was commissioned as an officer in the U.S. Navy, and is currently serving aboard the USS Truxton. Laney Widener completed B.A. degrees in Biology and Religion/Classics at the University of Rochester. 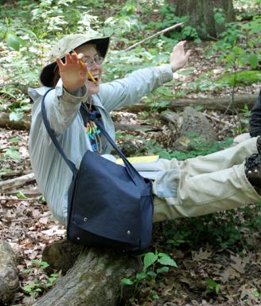 She conducted independent research in the Ramsey lab from 2008-2010, first studying the size and reproductive status of remnant American Chestnut populations and then the association between land-use history and invasive plant abundance in Monroe Co. forests. She was a member of the summer 2010 field crew. Laney then served as a Conservation & Land Management Intern (Chicago Botanical Garden) with the BLM in Needles, California, in 2011, and worked with the Nature Conservancy of Washington as an AmeriCorp Intern in 2012. She is finishing an MSc. degree in Conservation Biology at Northwestern University. Melanie Carter completed her BSc. in Environmental Sciences major at SUNY-Brockport. She worked part-time in the Ramsey Lab in 2008-2009, assisting with studies of the invasion biology of English ivy and computer simulation models of polyploid formation and establishment in plants. 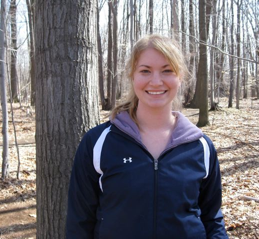 Melanie is currently a graduate student in Ecology at SUNY-ESF in Syracuse, NY, where she works with Jesse Brunner. Alison Ossip-Klein completed a BSc. in Ecology & Evolutionary Biology at the University of Rochester. 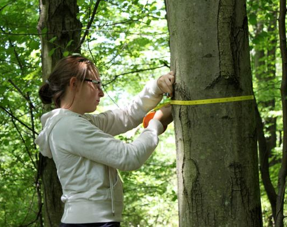 She conducted independent research in the Ramsey lab in 2008-2009, evaluating the diameter, height and taxonomic composition of canopy trees in Rochester old-growth. Allison completed an REU at Arizona State University (studying mating signals and sexual selection in birds) and a senior thesis with Rich Glor (studying hybridization in anole lizards). Alison recently enrolled in the PhD program in the Department of Biology at Indiana University, where she works with Emilia Martins. Maria Strangas completed her BSc. in Biology at the University of Rochester. 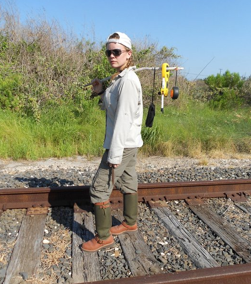 She served as a teaching assistant for BIO 263 Ecology and participated in several research projects in 2009-2010, including stand structure of Rochester-area old-growth, pollinator communities of meadow communities, and reproductive success of loggerhead sea turtles. 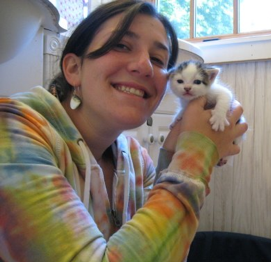 After working on the summer 2010 field crew, Maria moved to Queens, NY, and worked as a research technician. In 2012, Maria entered the PhD program in Biology at the City College of New York, where she studies phylogeography of amphibians in Ana Carnaval’s research lab. Nitasha Dhiman completed her B.Sc. in Biology at the University of Rochester in May 2011. She conducted independent research in 2008-2009, studying amphibian diversity in old-growth habitat on the South Campus as well as hybridization among feral apples in second-growth forest. Nitasha went on to an undergrad research position in the UR Medical School. Following graduation, Nitasha enrolled as an MSc. student in the Public Health program at John Hopkins University, where she researched health disparities in disabled populations; in fall 2013, she entered the MD program at Virginia Tech (Carilion School of Med.). Hannah McDonough completed her BSc. in Earth & Environmental Sciences at the University of Rochester. She worked in the Ramsey and Garzione labs (Department of Earth & Environmental Sciences) from 2008-2010. 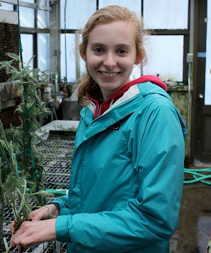 For her senior thesis, Hannah investigated the genetic and environmental contributions to water use efficiency and C13 fractionation in the North American Achillea, a complex of ecological races that occurs across many climatic and soil conditions. Hannah completed an M.Sc. in Geology at Utah State University, and now works as a hydrogeologist at GeoEngineers Inc. in Seattle, WA. Justin Budnik completed undergraduate degrees in Ecology & Evolutionary Biology and Health & Society. 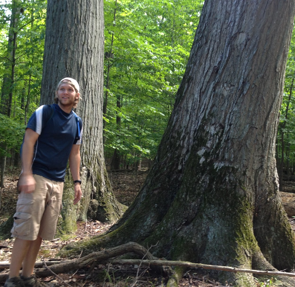 For his senior thesis, J.B. studied understory plant communities on the South Campus and Lynch Woods, with comparison between areas of different environmental history and edaphic characteristics. He continued this research as a member of the summer 2010 field crew, and was a research technician shared between the Fry and Ramsey labs for the 2010-2011 academic year. In August 2011, he started medical school at the University of Rochester Medical Center. Emily Gray completed a B.Sc. in Ecology & Evolutionary Biology at the University of Rochester. 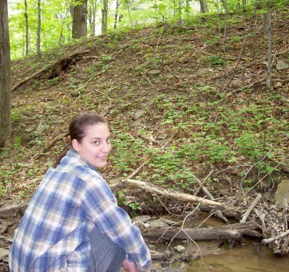 She conducted independent research on macroinvertebrate communities and physical attributes of West Brighton aquatic habitats in 2009-2010, and went on to be a teaching assistant for BIO 225 Lab in Ecology & Evolutionary Biology. Emily is currently a graduate student in the Department of Marine Sciences at the University of North Carolina-Chapel Hill. Layla Hatem completed a B.Sc. in Cell & Molecular Biology at the University of Rochester. She assisted in Ramsey lab research projects from 2008-2010, including studies of triploid ivy growth performance, niche modeling of cytotype distributions in creosote bush, and surveys of canopy trees and coarse woody debris in Rochester-area forests. Layla went on to work in a molecular genetics lab at the University of Rochester Medical School, for which she was supported as a De Kieweitt Fellow in summer 2011. In 2013, Layla started as a medical student in the Thomas Jefferson University in Philadelphia, PA.
Hannah Pullman completed her BSc in Ecology & Evolution at the University of Rochester. 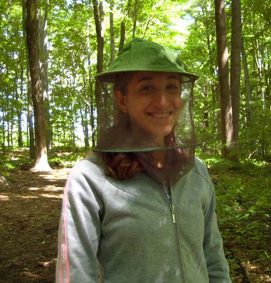 She conducted independent research in the Ramsey lab from 2009-2010, and was funded by the Garden Club of America to study avian communities of Rochester-area forests. Hannah worked as a research assistant in the Ramsey lab in 2010-2011, assisting with data entry, creosote bush morphometrics, and conservation activities on the south campus. Hannah now works as the community manager for Fresh Nation Farmer’s Market in Connecticut. Ariel Simons completed her B.Sc. in Biology at the University of Rochester. She worked in the Ramsey lab in 2008-2009. Ariel was a teaching assistant for BIO 263 Ecology and helped with several research projects, including studies of English ivy and vegetation comparisons between old-growth vs. second-growth forests on the South Campus. 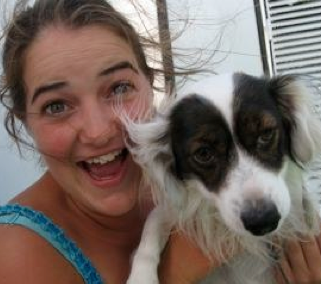 Following graduation, Ariel served for two years as a Peace Corp Volunteer in Lesotho, Africa. She accepted a position as a Peace Corp recruiter in 2012 and now lives in the Washington, D.C. area. Becky Domalski completed her BSc in Ecology & Evolutionary Biology at the University of Rochester. She conducted independent research in the Ramsey lab 2009-2010. Becky’s senior thesis evaluated the microdistribution of tree species on the South Campus and nearby Lynch Woods in relation to soil texture, nutrients, and organic content. After graduation, Becky worked with the Macular Degeneration and Aging research group at the UR Medical Center, and in 2011 enrolled as a medical student at the New York Institute of Technology. Morgan Dow completed BA degrees in Philosophy and Mathematics at the University of Rochester. 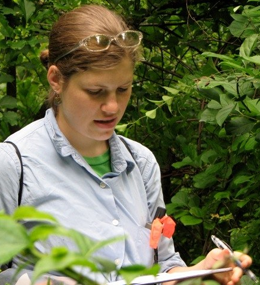 She assisted with ecophysiology studies of wild yarrow in the spring and summer of 2012, including analysis of transpiration rates, leaf surface area, and whole-plant architecture. 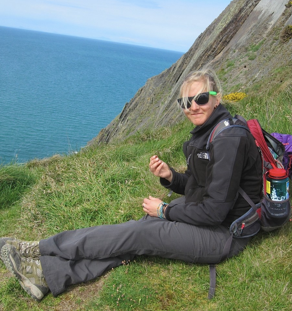 Following hiking travels along the Appalachian Trail in August 2012, Morgan entered the PhD program in Philosophy at the University of Kentucky, where she studies historical aspects of continental philosophy. Deb Korzun completed her BSc. in Ecology & Evolutionary Biology at the University of Rochester. 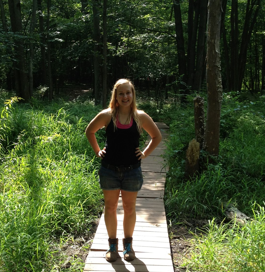 In summer 2013, Deb studied growth and architectural features of diploid Hedera helix and tetraploid H. hibernica plants sampled from the species’ native range in Europe, and in the 2013-2014 academic year served as a teaching assistant for BIO 263 Ecology. Deb is currently enrolled in the Physical Therapy program at Emory University. Michael Wallis completed his B.Sc. in Ecology & Evolutionary Biology at the University of Rochester. 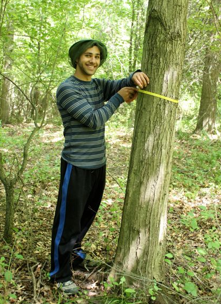 He was a teaching assistant for BIO 263 Ecology and, for his senior thesis, studied stand age and disturbance history of Rochester old-growth forests based on cores of canopy trees (oak, hickory, tuliptree). 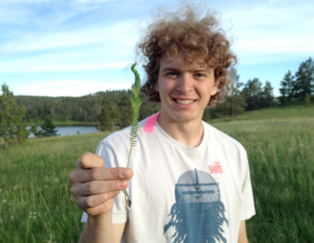 Michael moved to South Dakota with the Ramsey Lab and enrolled in the MSc. program (Integrative Genomics) at Black Hills State. His project used microsatellite markers to investigate genetic structure of the circumpolar Achillea millefolium aggregate, including evidence for multiple origins of ecological races and polyploid cytotypes. Brett Montieth completed his BSc. in Biology and minor in Chemistry at Black Hills State University, and is now enrolled in the MSc. program (Integrative Genomics) where he works with Professor John Dixson. Brett’s research focuses on blood chemistry associated with infection by Plasmodium falciparum, a protist and causative agent of malaria. 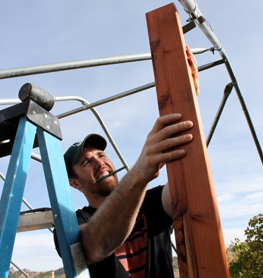 Brett is super-handy with a hammer and saw, and has worked hourly with the Ramsey lab in setting up its research infrastructure (greenhouse, grow-room, garden plots, fencing, etc.). Brett plans to defend his thesis in spring 2016 and has recently submitted applications to medical school. Anna Hafele completed BA and BSc. degrees in Outdoor Ed and Biology at Black Hills State University as well as independent research on Mt. Pine Beetle phylogeography as a SD-BRIN undergrad fellow. She has recently worked as an education intern at the Journey Museum & Discovery Center (in Rapid City), herbarium technician (in BHSU’s herbarium facility), and research assistant (in the Ramsey lab). Anna entered the MSc. program in Integrative Genomics at Black Hills State in 2015, and for her research is using microsatellite markers to study population genetic structure and patterns of invasion patterns for English ivy (diploid Hedera helix and tetraploid H. hibernica) from Europe into the U.S.
Darlene Coppe is a junior biology major at Black Hills State majoring; she is also an RA for BHSU dormitories. 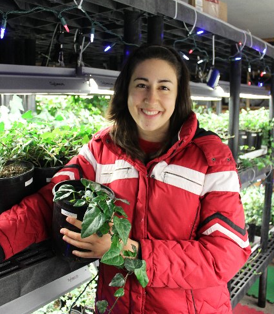 She has conducted research with the Ramsey Lab since 2014, first assisting with construction and set-up of plant facilities in the off-campus garden and specimen preparation in the BHSU herbarium. 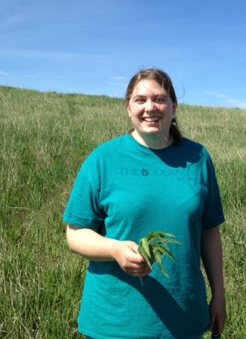 In summer 2015, she was a member of the field crew performing vegetation surveys in sites inhabited by wild yarrow across western South Dakota. Most recently, she has focused on identification of paleobotanical samples recovered from archaeological efforts in the City of Deadwood’s historical Chinatown District. Alissa Iverson is a junior biology major at Black Hills State; she also is a member of the campus debate team and campus writing center. She completed the Plant Systematics course taught by the Ramseys in 2014 and thereafter has assisted the Ramsey Lab with the construction + maintenance of plant facilities in the off-campus garden and specimen preparation in the BHSU herbarium. Since August 2015, Alissa has worked on identification of paleobotanical samples recovered from archaeological digs in the City of Deadwood’s historic Chinatown District, investigated uses of plants for food and ceremony in the late 1800s; she has also conducted research with Dr. Katrina Jenson in the BHSU chemistry program. Kendall Murie is a senior biology major at Black Hills State; he also competes on the BHSU track/field and cross-country teams. 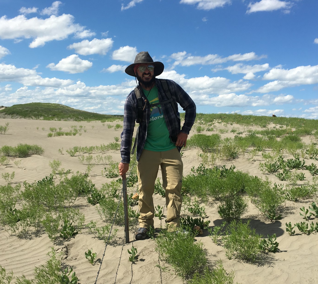 Kendall worked with the Ramsey Lab in summer 2015 as an NSF REU participant -- with Zak Kay, he conducted field surveys of wild yarrow sites across western South Dakota, including plant species inventories, Robel pole measurements, and estimates of forest stand structure. 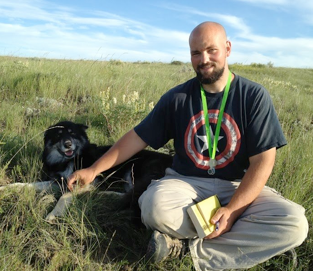 With family connections to northcentral Montana and central South Dakota, Kendall has interests in grassland habitats and graminoid plant species. Zak Kay is a junior biology major at Black Hills State. He served for several years in the U.S. military and is now preparing for a career in field biology. 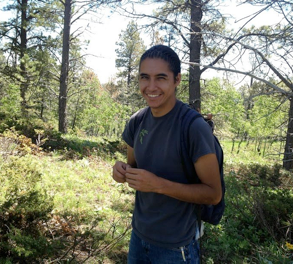 Zak worked with the Ramsey Lab in summer 2015 as an NSF REU participant -- with Kendall Murie, he conducted field surveys of wild yarrow sites across western South Dakota, including plant species inventories, Robel pole measurements, and estimates of forest stand structure. Originally from Nebraska, Zak has developed a strong preference for mountain regions and forest habitats over grasslands. Michael Hurst is a junior at Black Hills State University who is double-majoring in chemistry and biology. Michael was a South Dakota BRIN Undergraduate Fellow in summer 2015 and worked with the Ramsey Lab on field survey efforts in wild yarrow populations as well as chemical extractions of Achillea leaves and preliminary testing for anti-microbial activity; he has also worked with Dr. Katrina Jenson in the BHSU chemistry program. Michael will be presenting his research at the 2016 NCUR conference in Asheville, NC. Anthony Checchi is a junior biology major at Black Hills State University with interests in ecology and organismal biology. Anthony has prior experience in construction and since 2015 has assisted the Ramsey Lab with the design and assembly of research spaces in its off-campus plant facilities. Anthony also assists with organization of live plant accessions, propagation efforts, and DNA extractions. Jessie Clark is a junior biology major at Black Hills State University.